The jawbreaker is a type of hard, round candy that is ideally so difficult to bite down on that it must be sucked. Jawbreakers range from the size of a hazel nut to the size of a golf ball, and come in many flavors and colors. They are popular with children, and often sold in vending machines. Though originally a trade name, the term jawbreaker became so widespread that it is considered a generic name for any brand candy of this type. Both written and pictorial records indicate Egyptians prepared sweets with honey, sweet fruits, spices, and nuts. Sugar was not known in Egypt, and the first written evidence of its appearance dates to A.D. 500 in India. The method of making sugar from the boiled syrup of the sugarcane plant spread from India through the Arab world, and sugar was introduced to Europe sometime around A.D. 1100 It was first thought of as a spice, and even up through the fifteenth century, sugar was so rare that it was used, for the most part, only medicinally, prescribed in minute doses by physicians. By the sixteenth century, widespread sugarcane cultivation and the technology for refining sugar developed sufficiently that sugar was not such a precious commodity. Small manufacturers produced crude candies in Europe at that time. The methods used were all simple, and produced the kinds of candies that could still be made at home today. By the late eighteenth century, entrepreneurs had developed candy-making machinery, and more complex candies were made and on a greater scale. Candies are distinguished in broad categories by their hardness, and this corresponds to the temperature to which the sugar is heated. 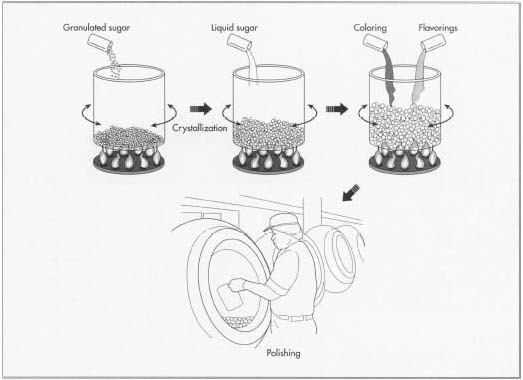 Sugar cooked at a low temperature results in chewy candy; medium heating results in a soft candy; and sugar cooked at a high temperature becomes hard candy, where the sugar is fully crystallized. The jawbreaker, being a type of hard candy, is similar to many candies popular in the United States in the mid-nineteenth century. These hard candies were generally sold singly. A storekeeper pulled out the desired number of pieces from a loose bunch in a glass case or jar. By the mid-1800s, there were close to 400 candy factories operating in the United States, turning out penny candy and other types. During the hot panning process, sugar is slowly crystallized into balls that grow into jawbreakers. original Jaw Breakers. These candies became so popular that the earlier meanings of the term jawbreaker disappeared, and it began to be applied to all candies of this type. There are many manufacturers of jawbreakers today, though Ferrara Pan remains the leading maker of hot pan candies in the world. The crucial ingredient in the jawbreaker is sugar. All other ingredients form only a tiny percentage of the finished candy. Jawbreakers use natural and artificial flavors and a variety of artificial colors. Manufacturers may also add calcium stearate, a binding agent, and a wax such as carnauba wax, to provide a shiny, polished surface. Jawbreakers are made by the hot pan process, and the type of pan used is very important. Candy-making pans are little like pans found in an ordinary kitchen. They are huge spherical copper kettles with a wide mouth. The pans rotate constantly over a gas flame so the sugar inside is kept tumbling. The worker who makes candy in using these pans is known as a panner. 1 A worker puts granulated sugar into the pan while the pan heats over its gas flame. Each grain of sugar in the pan will eventually become a jawbreaker as it crystallizes, and other grains crystallize around it in a spherical pattern. The panner begins this process by filling a beaker with hot liquid sugar. Using a ladle, the panner carefully pours the liquid sugar into the pan along its edges. The liquid sugar adheres to the sugar grains, and the jawbreakers begin to grow. But this is a lengthy process. With the pans continually rotating, the panner keeps adding liquid sugar at intervals over a period of 14-19 days. In total, the panner may add liquid sugar more than 100 times. The panner or another worker inspects the jawbreakers visually, to make sure the candies are growing perfectly round, and not lopsided. 2 Most jawbreakers are colored only in the outer layers. The panner adds the color and flavor ingredients to the pan when the jawbreakers are almost their finished size. The coloring and flavoring are pre-measured into a small bottle or beaker, and the panner pours them in carefully along the edge of the pan. As the pan rotates, all the jawbreakers in the pan receive the coloring and flavoring equally. 3 After approximately two weeks, the jawbreakers have reached their desired diameter, and they are removed from the hot pan to a polishing pan. This pan looks essentially the same as the hot pan. A worker pours the jawbreakers into the polisher and sets it to rotate. Food-grade wax is added, and coats each individual candy as the polisher revolves. After polishing, the jawbreakers are finished, and are now ready for packaging. 4 The first step of packaging is to measure the jawbreakers into small batches. This is done by a measuring machine. A worker loads the finished jawbreakers onto a tilted ramp. All the different colors can be mixed together at this point, so that the small batches hold an assortment. The jawbreakers roll down and fall into the central chute of the measuring machine. From the chute, the candies fall into trays that are arranged on spiral arms around the central chute. Each tray will only hold a specific weight, for example one pound. As soon as the weight is reached, the tray swings out of the way and the next tray loads. As the top trays fill, the bottom trays dump into the bagging machine. 5 Bagging is done automatically on a large machine that holds a wide spool of thin plastic on a revolving drum. The plastic is in a single layer at this point. The bagging machine forms the bags out of this material, fills them, and then seals them. The plastic may be imprinted with the logo of the candy manufacturer and any other necessary information. The machine unwinds a section of plastic from the roll and pulls it across a form that causes the plastic to fold length-wise in two. Heated jaws press along the fold and melt the two sides together, forming the side seam. The folded plastic is then drawn upwards again, and another pair of heated jaws clamp the bottom, forming another seam. Now the machine automatically cuts the top of the bag and holds it open. The pre-measured amount of jawbreakers from the measuring machine drops in, and more heated jaws then clamp the bag shut along the top. The filled and sealed bags then drop onto a conveyor belt. Workers take them off the belt and toss them into packing boxes. At this point the jawbreakers are ready for distribution or storage. Quality control is generally simple for jawbreakers. They are a relatively pure product, since they are close to 100% sugar. Workers rely on visual inspection to make sure a batch of jawbreakers is forming correctly. Since the process of making these candies takes about two weeks, and the pans are open, workers have many opportunities to observe the jawbreakers and see that they are shaped right. Each day, a worker may remove several jawbreakers from the batch in process and break them open. The crystalline structure inside should look like concentric rings. Workers also do a taste test. Making jawbreakers is a process that requires little technology, and quality control does not demand any elaborate chemical or physical analysis. If quality control reveals any defective jawbreakers, they cannot be melted down and reused. Since the sugar is crystallized throughout the product, it would have to be ground down. So there may be a small amount of waste in the process, if a portion of the product has to be thrown out. Otherwise, the manufacturing process creates no byproducts. Broekel, Ray. The Great American Candy Bar Book. Boston: Houghton Mifflin Company, Inc., 1982. Mintz, Sydney W. Sweetness and Power. New York: Penguin Books, 1985.